It has been the week that Windows 10 was officially released worldwide and there was one aspect of Windows 10 that I was especially intrigued by – the world of the Internet of Things (IoT). Windows 10 has a slimmed down version called “Windows 10 IoT Core” focused on the IoT. It is not a full version of Windows 10 by any means, instead it is focused on powering embedded systems. I had a very strong urge to give this OS a test drive and see what it’d be like, so I got out my Raspberry Pi and installed it! Approaching this whole endeavour from a non-Microsoft focused development background made this a challenge but also quite an interesting experience. It was nice to try out an alternative method to developing for the IoT. 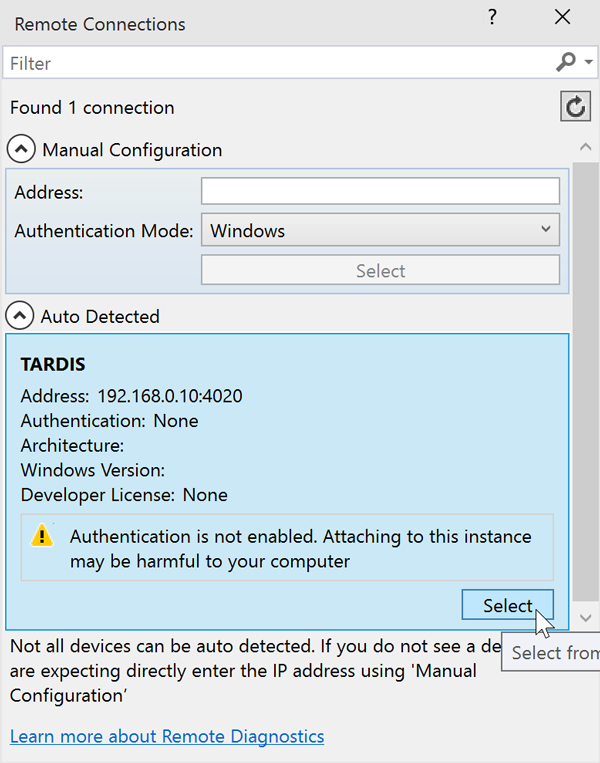 Whilst going through the whole process, there was a lot of documentation on how to install Windows 10 on the Raspberry Pi and get started, but various links and errors led me astray at times. In short – it was messy and confusing for the new guy. Definitely took a lot longer than I’d expected it to. In the hope that my own struggles would not be in vain, I’ve documented below how I installed Windows 10 IoT Core on my Raspberry Pi and the various issues I faced. Maybe there’ll be a developer just like me in the same boat who’ll stumble upon this article and gain an hour or two that would otherwise have been spent in confusion! At the end, we’ll get our Raspberry Pi to dance exuberantly! Well… as exuberantly as two servos with pipe cleaners attached can dance. A Raspberry Pi 2 – Mine in particular was a Raspberry Pi 2 Model B. I was told after this article went up that this process will not work for the original Raspberry Pi. A 5V micro USB power supply – Most Raspberry Pi users should have one of these. Microsoft say it needs at least 1.0A current, or more than 2.0A if you’re attaching a lot to it. I personally just used the one that came with my Pi and all was well. An 8GB or greater micro SD card – This will hold the Windows 10 IoT Core OS and your files. In order to ensure the card is fast enough to run the OS, make sure you get one that is class 10 or better. Microsoft suggests the Samsung 32GB EVO or the SanDisk 16GB Ultra Micro SDHC (I had the second one, conveniently enough that’s the one I was using on my Pi beforehand and it worked perfectly). A Windows 10 PC – In order to do any of this development, you’ll need Windows 10 on your computer. I was part of the Insider Preview program and thus already had a version I could use. 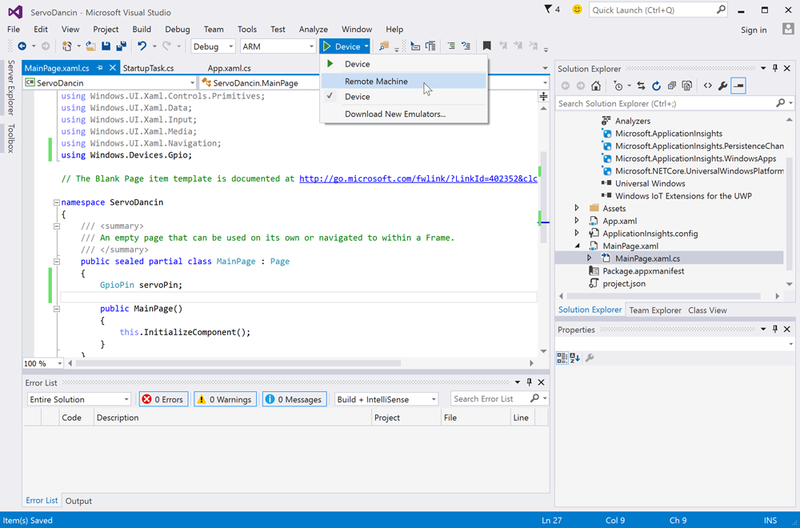 Microsoft Visual Studio Community Version 14.0.23107.0 D14Rel – I’ll detail how to get this soon. Windows IoT Core Project – I’ll provide details on how to download these too. Windows IoT Core ISO – It’s a little over 500MB, so if you’ve got a slowish connection like me – you might want to get this downloading as soon as you can. Download the ISO for Windows IoT Core here. Putty or another SSH client – Only if you want to SSH to the Pi. You could use PowerShell instead. A HDMI cable and a monitor to connect it to – You’ll need one to set up the install process and see your IoT app in action at the end. A USB keyboard and USB mouse – These will be your controllers for the Raspberry Pi, when we’re not SSHing into it. An ethernet cable – Sadly, it looks like only the official Raspberry Pi Wi-Fi adapter has the potential to work with Windows 10 IoT Core so far (I can’t guarantee that either as I don’t have that one! ), so in order to connect to your network you’ll need to plug it in via the Ethernet port. A micro SD card reader – You’ll need to be able to read that micro SD card on your PC. I used a micro SD adapter to plug it into my PC. Two servos – I used micro servos similar to these servos at SparkFun. Most servos will work here, the main difference will be how far they can rotate. Six male to female jumper wires – These are what we’ll need to connect the servos to the Raspberry Pi’s GPIO port. If you aren’t sure what these look like, here are some on the SparkFun site to reference. Two pipe cleaners – These are optional, if you want to give the servos arms, add some pipe cleaners! One thing that threw me whilst installing everything is that the version linked to in some of the Microsoft documentation isn’t compatible with the Windows IoT Core Project Templates due to an updated Microsoft signature. 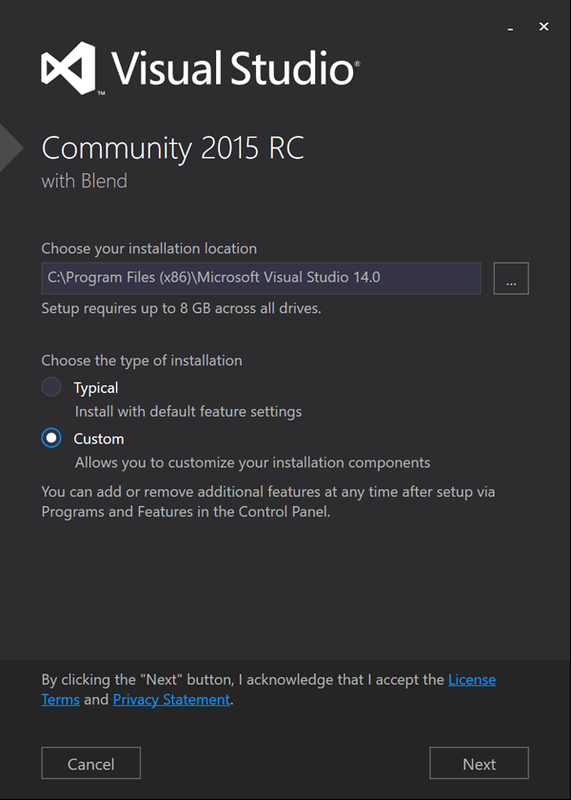 The correct version you’ll want to make sure you’ve installed is Microsoft Visual Studio Community Version 14.0.23107.0 D14Rel. 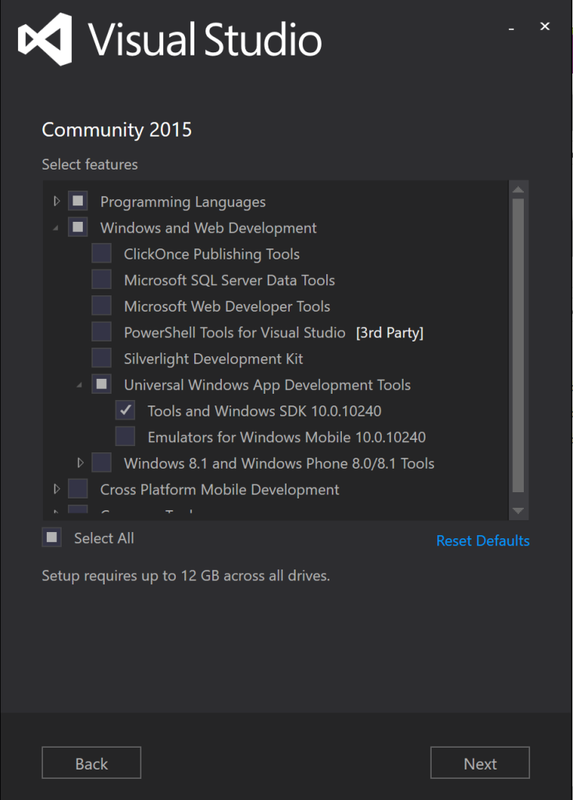 Go to the Visual Studio website and download the “Community 2015” version. This should be the compatible version, rather than any linked to directly in documentation. If you have installed Microsoft Visual Studio and you are receiving the error of “#SignatureDescription could not be created for the signature algorithm supplied”, then you’ve got the incompatible version of Visual Studio like the one I’d initially downloaded. All I can say to you is… you’re not alone! 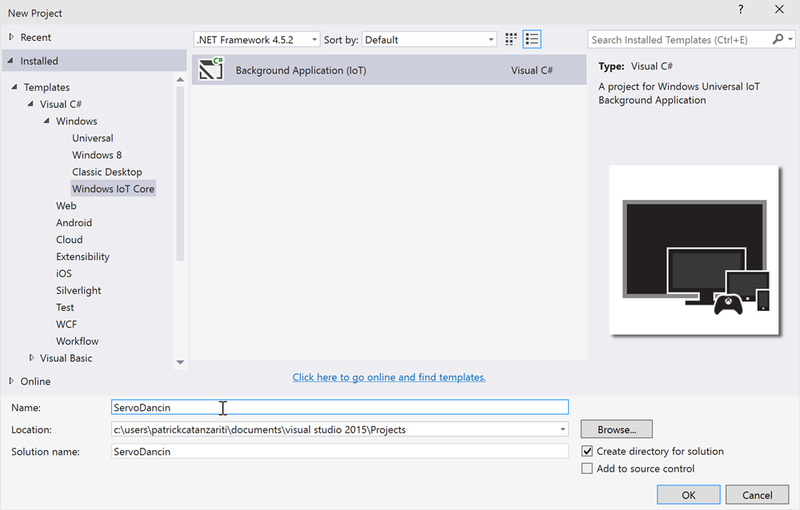 Grab a coffee and/or visit the outside world for a bit as this new Visual Studio does another run through of the installation process. When you install it, choose “Custom” installation. This is another area where I was caught off guard a bit. The initial documentation I tried led me into the “Update & Security” settings in Windows 10. However there is a bug in my version of Windows 10 where any time you click the “For developers” link to enable it, the Settings window crashes and closes. So this method wasn’t the best option. 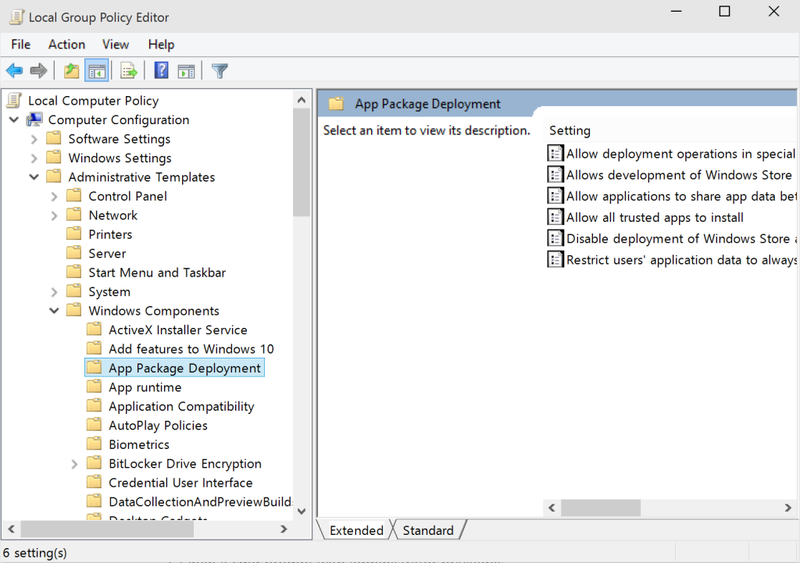 Then, navigate to Local Computer Policy > Computer Configuration > Administrative Templates > Windows Components > App Package Deployment. Restart your computer to enable these policies. 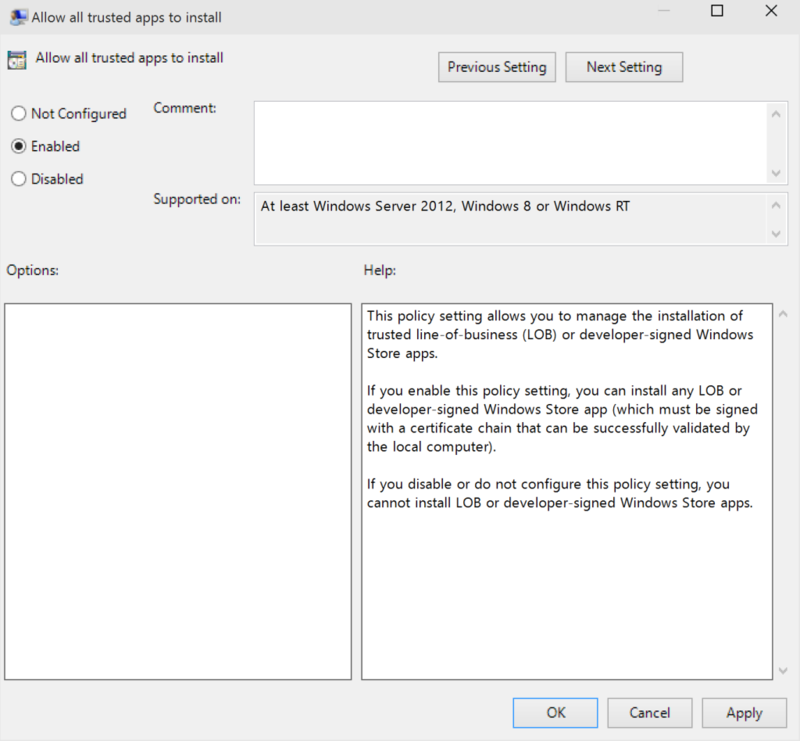 If you have difficulties with this method, check the Enable your device for development page in Microsoft’s documentation for other potential ways to enable it. 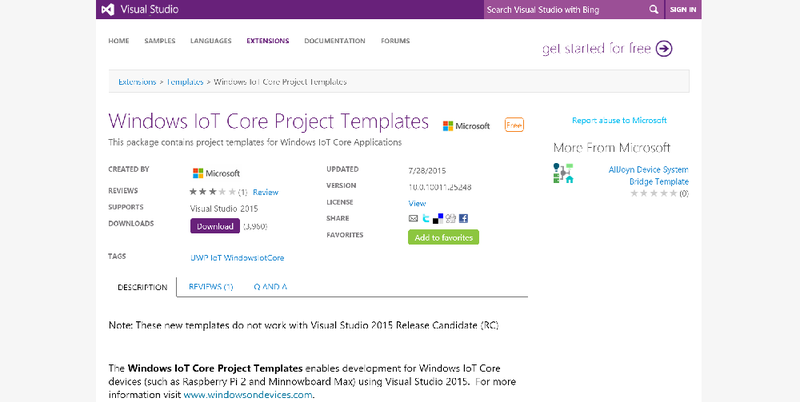 The first thing you’ll need to do is download the ISO for Windows IoT Core. If you started downloading it from earlier in the article, hopefully it’s all finished downloading already and you’re ready to go! Go to the new drive that has popped up and install “Windows_10_IoT_Core_RPi2.msi”. Once that is complete you can eject your virtual drive from the system. 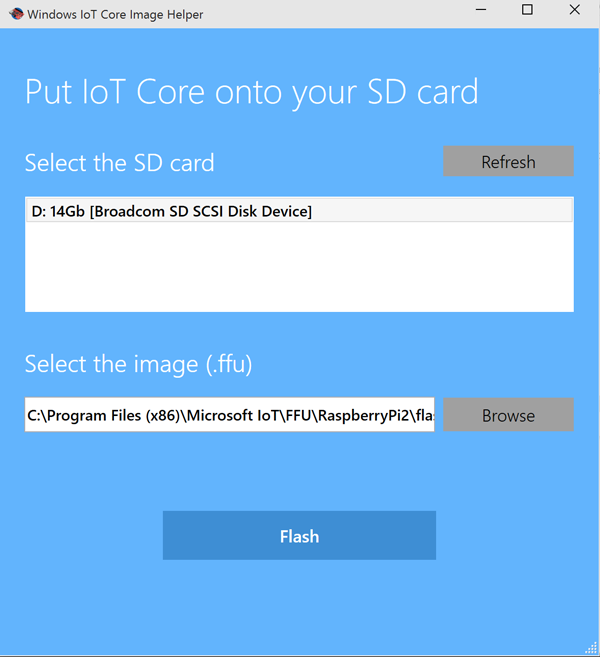 Next, we want to put Windows 10 IoT Core onto your Raspberry Pi’s micro SD card. Place that into your SD card reader (or adapter of some kind if your PC doesn’t have a reader for it). When it’s done, eject the drive nicely via the “Safely Remove Hardware” option in Windows and then safely remove it. Put it into your Raspberry Pi and connect up your HDMI monitor, USB keyboard and mouse. When you’re preparing to turn on the Pi, make sure you don’t have any other peripherals connected. My Pi wouldn’t boot at first, it only booted once I removed my Raspberry Pi camera and USB Wi-Fi module. When you’ve got them all connected, connect up the power supply to your Raspberry Pi and it should begin to boot up. Take the power out from your Pi and plug your SD card back into your PC. In the SD card, there’ll be a file called config.txt. Open that up. There is a line in this file that starts with hdmi_group =. If it says hdmi_group = 2, try switching it to hdmi_group = 1 and vise versa. One of those should work on your screen. Once you’ve changed the 1 to a 2 or the 2 to a 1, safely remove it from your PC and plug it back into your Pi. Connect the Pi to power and you should now be able to see the display in its full glory! If that still doesn’t work, this post on the Raspberry Pi forums might provide you with a bit more info. There are two ways you can connect to your Pi remotely from your PC via command line style input. Either via PowerShell or via SSH. Most articles cover PowerShell but I was more familiar with SSH and figured why not take the road less travelled? It also felt like the better long term option in order to keep the way I access all of my IoT devices and servers consistent as most of them work via SSH too. If you would prefer to use PowerShell, see the Microsoft PowerShell documentation. Make sure that SSH is selected and then click “Open”. Click “Yes” to any security alerts that pop up about the server’s host key. Others have connected servos to a Raspberry Pi via a GPIO pin connector onto a breadboard (see Adafruit’s example) and some connect it up to a breadboard first. Choose your own personal preference. 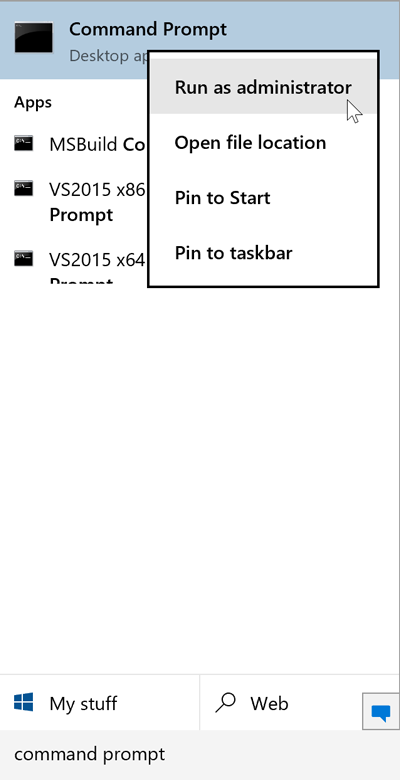 It will work either way as long as the pins correspond correctly to the app’s definitions of them. If you’d like to check which pins correspond to which output, Microsoft have a lovely page which defines the Raspberry Pi 2 Pin Mappings. The numbers you’ll refer to in your code on that page are the ones like “GPIO 27”. Our IoT Demo Code is available on GitHub. Download that if you’re already familiar with the process and just want to see it running. Our Raspberry Pi by this point is ready to go. 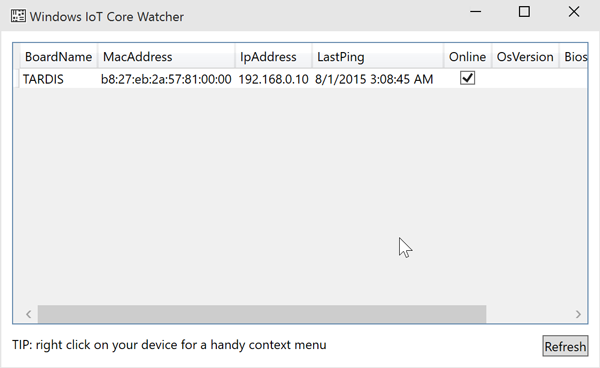 If you type in “Windows IoT” into the Cortana taskbar search box again, you’ll see one of the options other than the WindowsIoTImageHelper one is WindowsIoTCoreWatcher. After all the previous steps, your Pi should appear. If it wasn’t here, you wouldn’t be able to SSH into it. I point out this screen only because it can be useful if your Pi times out or loses network connectivity for some reason whilst your developing. It’s a good tool to know about! 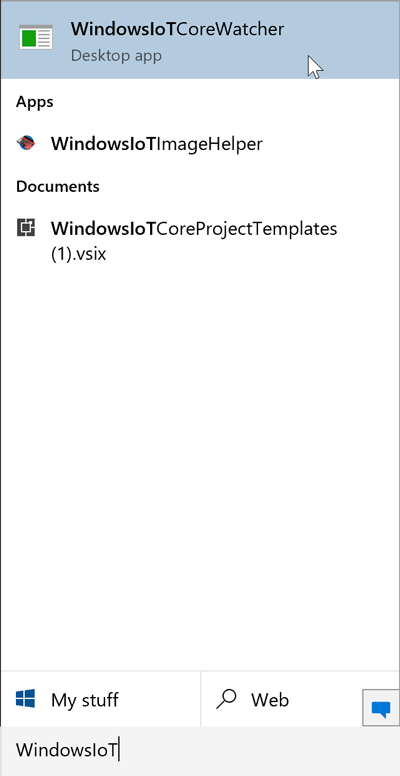 Open up Visual Studio and go to File > New > New Project. 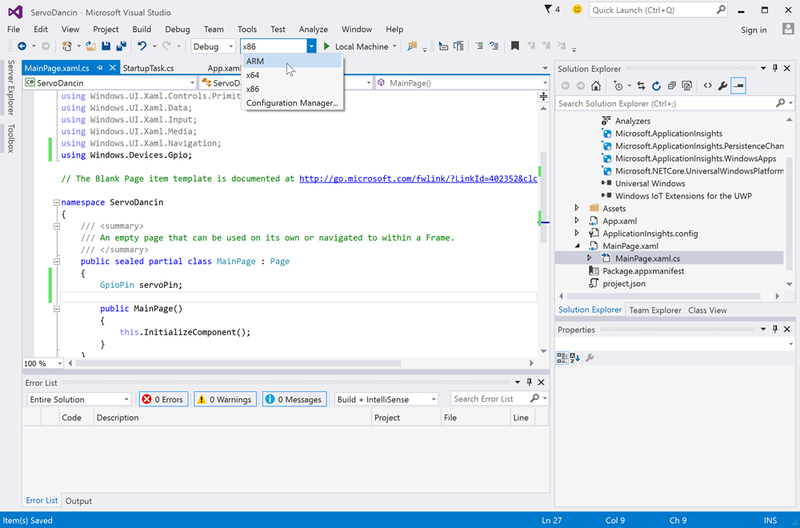 From there open up the templates and choose Templates > Visual C# > Windows > Windows IoT Core. 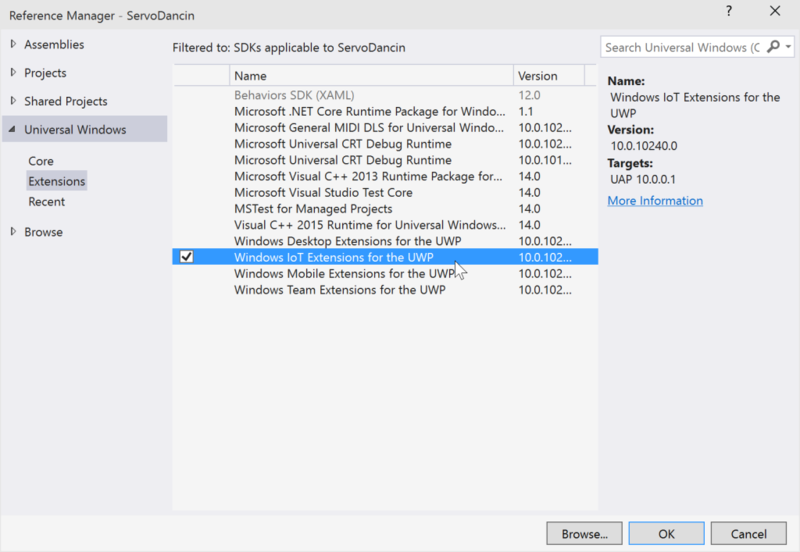 Choose “Background Application (IoT), type in the name of your app (I chose “ServoDancin”) and click OK.
Once that has loaded, you’ll want to make sure you’ve got references added for the IoT Windows 10 functionality. To do that, right click the “References” section underneath your project name in the “Solution Explorer” window. Choose “Add Reference”. In the window that opens, go to “Universal Windows” > “Extensions” and choose “Windows IoT Extensions for the UWP”. Click OK. Now we’re ready to add in our code. This example is in C#. You can code in C++ if you’d prefer, but you’d need to rewrite the below example in C++! 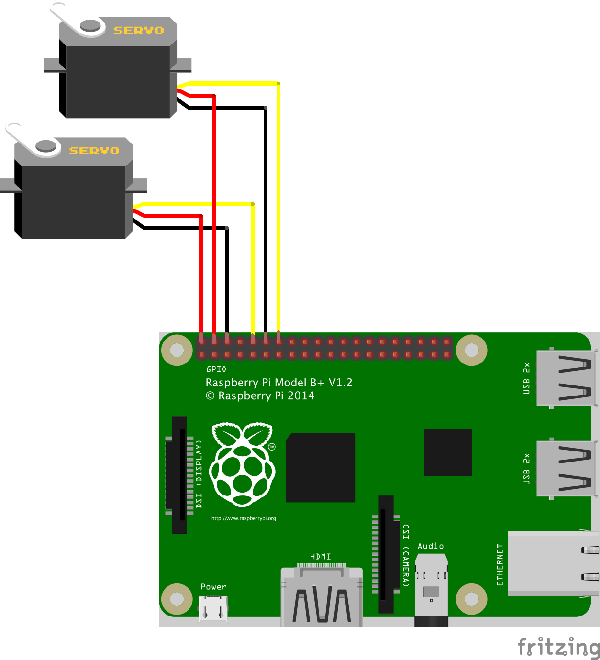 In our example, we’re going to connect up two servos to our Raspberry Pi and get them to dance back and forth to celebrate our joy that Windows 10 has an IoT edition! currentDirection = 0; // Initially we aren't dancing at all. The start bits are pulling in the bits of functionality required for our app. I believe most of the below are the core bits and pieces that will run our IoT application and read the xaml file we’ll be making soon. We then set the two positions for our servo that we’ll be switching it to (1 is a one millisecond pulse which turns a servo clockwise and 2 is a two millisecond pulse which turns a servo counterclockwise). We use currentDirection to store the current movement we’ve got it doing. If our servo pins are not null, we start our timer and we also start a background process which pings our servo at the regular 20 millisecond intervals. It is within this background process that we send the current direction we’d like it to travel. If all goes well with the GPIO pin initialization, then we display a message showing that all is ready! Our Beat() function is what toggles the direction of our servo. It doesn’t tell the servo what to do specifically, it’s just switching the currentDirection variable to change the direction our background pulsing process will tell the servo to move in. It also sets our text in the app to alternate messages for a bit of added fun. MotorThread() is where our background process regularly sends pulses to our servo to get it to respond and dance. If the currentDirection is either 1 or 2, it’ll send a high message to the pin. Then it waits either one or two milliseconds (the amount of our currentDirection) before sending a low pulse. The timing between these highs and lows is what tells servos which direction to move. We then wait the remaining time within the regular 20 millisecond pulse interval for our servo before repeating this again. In order to actually perform that Wait() function, we’ve got to define it, so as our final function for the app, we set up that function here. It uses the stopwatch we set up earlier and holds up our thread until the number of milliseconds has elapsed. The MainPage.xaml file sets up how our app is going to display on our HDMI screen. If you are building an app which doesn’t require the display at all, you could set up your Pi to run in Headless mode, which sounds a little creepy but just means it doesn’t display anything on a screen and relies on command prompt style connections instead. Our app is going to be a Headed app which does display on a screen. If you’d like to read up on the difference between the two and how to set that up, see Microsoft’s docs on Headed and Headless modes. The rest is all focused on displaying text in our app. All our app is going to have is a single text block called “GpioStatus” that initially tells us if the GPIO pins are initialized, but then will display messages in time with our dancing servos. 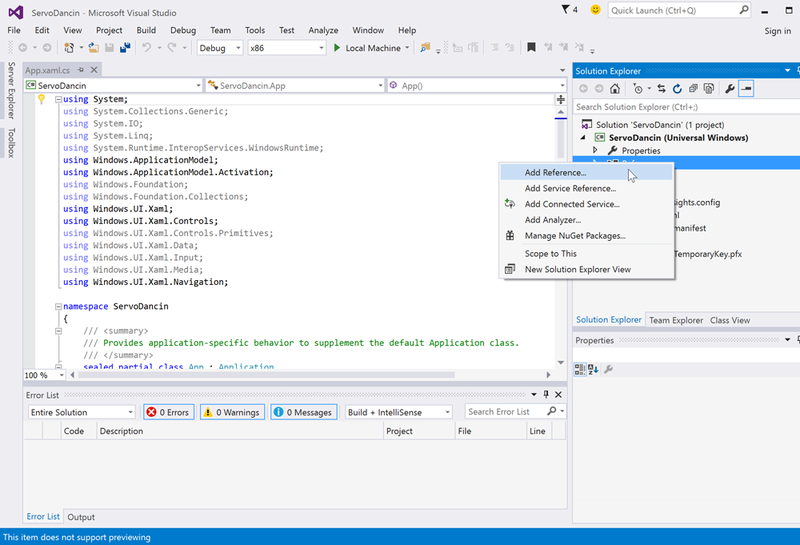 In order to put that app onto our Raspberry Pi, we’ve got to set up Visual Studio to compile and send the app to a remote machine (your Pi). The Raspberry Pi runs on an ARM processor, so in the dropdown next to “Debug”, you’ll want to select “ARM”. If you aren’t seeing an option for these, check that you created the correct type of project in the earlier steps and that you added in the Windows 10 IoT references above too. In the dropdown next to that one, choose “Remote Machine”. Click “Select” to choose it. Then click that play button option once more now that it says “Remote Machine” and it should put your app onto your Pi! If you have any issues getting it onto your Pi after a little while, try restarting your Pi. When your app runs, it should look like so! That should cover the whole process of getting started with the Raspberry Pi and Windows 10 IoT Core, including my personal lessons from various mistakes and confusions! I hope it helps speed the process up for others and leads to some pretty exciting Windows powered IoT demos. If you do make an exciting Windows powered IoT demo based upon this code, leave a note in the comments or tweet at me (I’m @thatpatrickguy), I’d love to see it!